Fortunately, the bells were restored and over the centuries the numbers increased to their present ring of 10, the last two being installed in 1991. The glass screen dividing the ringing area from the nave came from the Roman Catholic Church of St Joseph in Redhill when it was demolished and siginfies the close links which have existed for many years between our two communities. The porch and the great oak door date from 1460. Over the porch is a room where our Elizabethan ancestors stored their 'harness' against the Spanish in 1588. The figure of Our Lady and the Holy Child above the door outside is modern. The beautiful but very faded statue by the door to the Rood stair dates from the mid 19th Century and was made in the south Tyrol. We are currently appealing for funds to restore it to its former glory - the colours more closely matching those of the Reredos. The rood screen which separated the Nave from the Chancel was pulled down at the the of the Reformation. The chancel arch dates from the Perpendicular alterations made in about 1460 by the Duke of Buckingham and his chaplain, Hugh Hexstall, who became Rector in 1451. They altered the whole alignment of the church to fit the new south arcading of that date. The Reredos above the High Altar is by Street (1870) and is notable for the figure of Samuel Wilberforce as Bishop of Winchester (Bletchingley was at one time in the diocese of Winchester) among the apostles and saints. 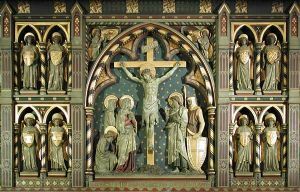 The central panel depicts the crucifixion and on either side are four angels with shields each bearing an element of Christ's passion.